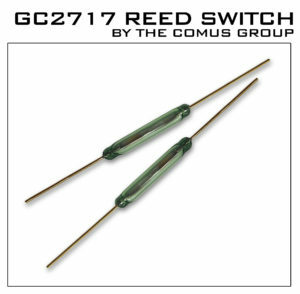 The Comus Group is proud to introduce the GC2717 reed switch made by its Switching Technologies Gunther Division located in Chennai, India. The STG GC2717 offers a 1 Form A Rhodium contact for applications with switching voltages up to 500 VAC/VDC and dielectric strength (BV) of up to 1300 VDC. The GC2717 contacts are rated for 10 VA with 0.5 Amp switching and 1.0 A carry currents. The GC2717 is UL recognized E103299 and RoHS Compliant. The reed switch has gold tinned leads for ease of soldering and is available with cut and formed leads.